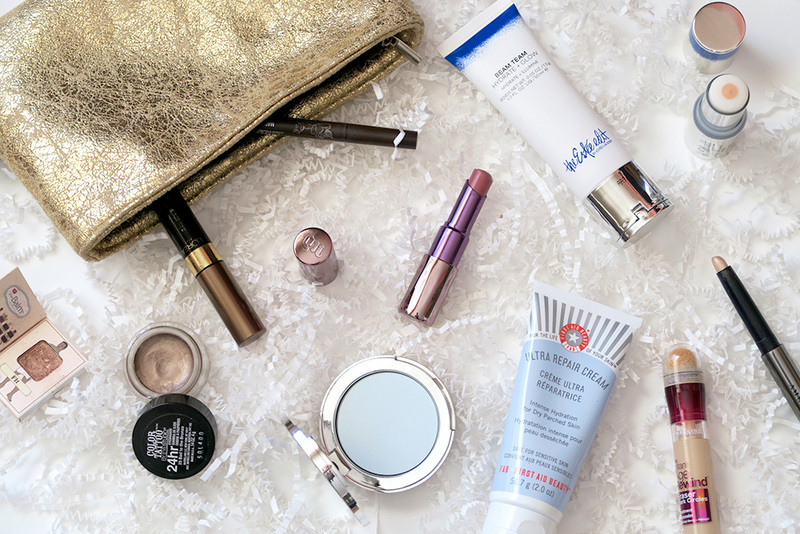 The winter seasons always shake up my makeup routine – I have to compensate for the fact that my skin will be super dry and no amount of green concealer will fix my drippy red nose. I opted to skip out on foundation most days unless going out and interacting with the real world – I didn’t really feel like including it since I’ve only been using one foundation since November (Giorgio Armani Luminous Silk Foundation in 2), so if my posts are sans foundation, it’s likely going to be that. 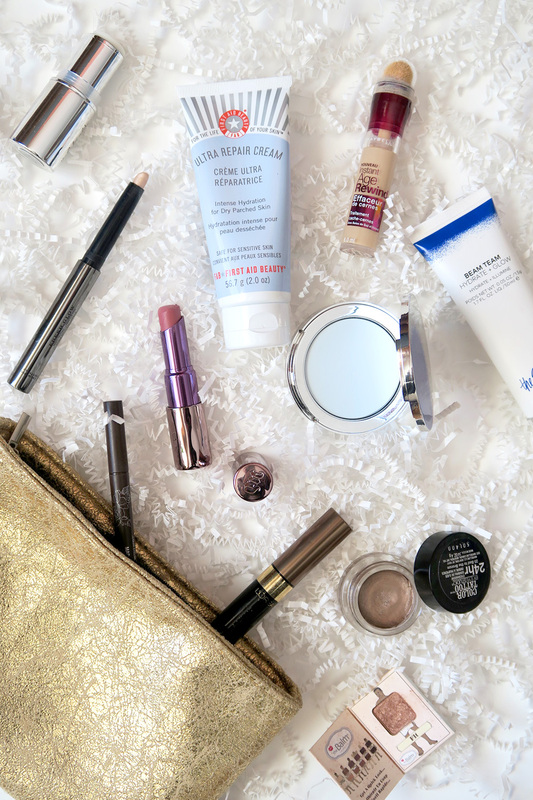 Here are some items that have been living in my makeup bag during the month of February. The makeup bag is from The Face Shop, which was for a sample bag I think! I’ll admit, I don’t like liquid primers that much – I don’t really feel like they do much for me? If anything, it just feels like I’m caking on more makeup. This stick, however, feels ultra-lightweight and non-greasy on the skin. It quickly conceals the look of pores. Read my review here! I’ve been loving this as a highlight on my (non-existent) cheekbones! 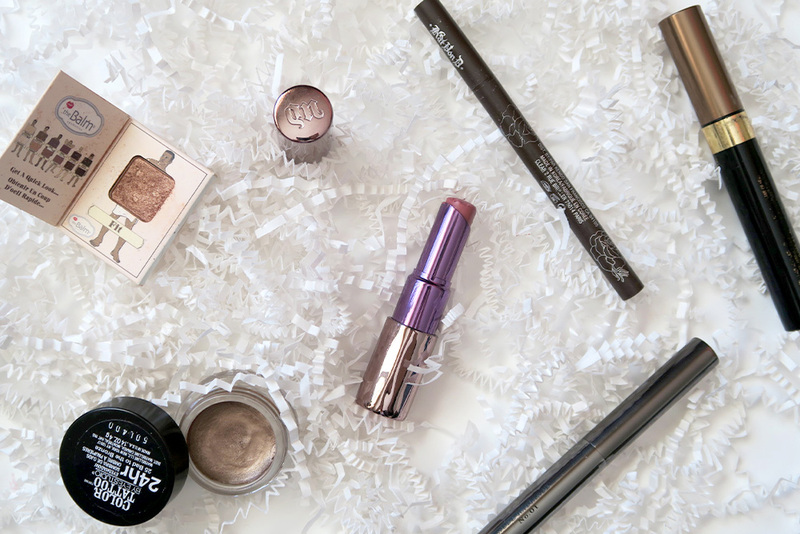 It creates a subtle glint on the cheeks, and doesn’t look too glittery or overpowering. Read my review here! My mom originally bought this but it turned out to be too light for her skintone – luckily for me, it seems to be a perfect match! It has been my everyday concealer, super easy to slap on and dash out the door. Does an okay joy of concealing the redness around my nose, so I’m not complaining. The blue tint of the powder really threw me off at first because I thought I was going to look ashy – turns out that it’s actually the ideal powder compact that I’ve been looking for! It has a super silky formula and works just as well as my Bombshell Cosmetics loose setting powder to set my undereye area. Read my review here! I’m so happy I finally found a brow gel that works for me! I like that the brush is thinner and more controlled, unlike the Maybelline brow gel I tried a while back that had the weird round brush? The fibres in the L’Oreal gel beef up my brows whilst still looking natural. For the days where I want a ~fresh sheer glow~ across my eyelids! I almost always use this as an eye product because it’s so easy to use. Very quick and low maintenance, great for those days where you don’t want to put on much eye makeup, and a few swipes on the top of the cheeks makes for a light highlight. I had a sad moment with this when I was getting ready in the morning, forgot to twist down the lipstick, and stuck the cap on… RIP the pretty bullet shape. It’s a thick and glossy pink mauve lipstick that is super hydrating and sits comfortably on the lips. 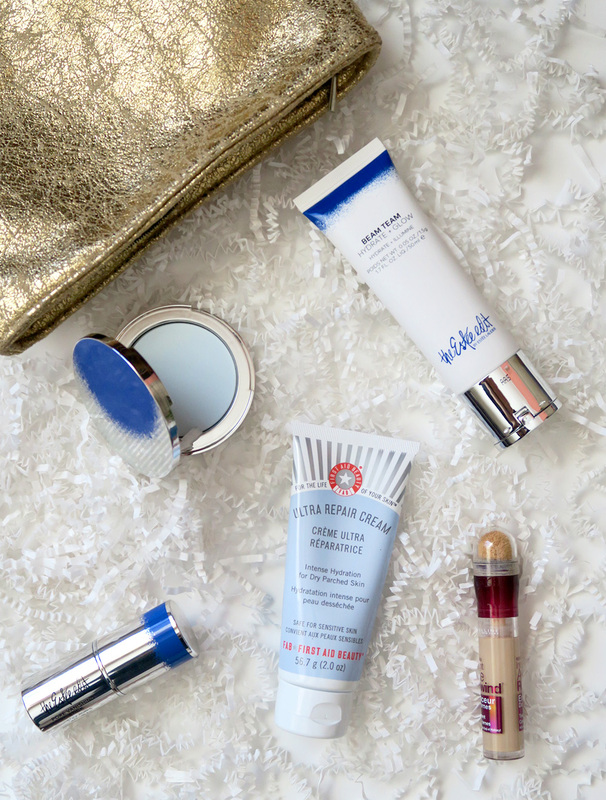 What products have you been loving this month? I predict that March is going to include a lot of Tarte….. I just ordered a few bits from the newly released Rainforest of the Sea collection, so you’ll be seeing those on the blog soon!